Both players lead a group of Subulatas. The Subulata is a type of grasshopper which swims too (Latin name: Tetrix Subulata, English name: Slender Ground Hopper). For Subulatas the water is always more blue at the other side of the pond. Therefore you try to reach the opposite corner. 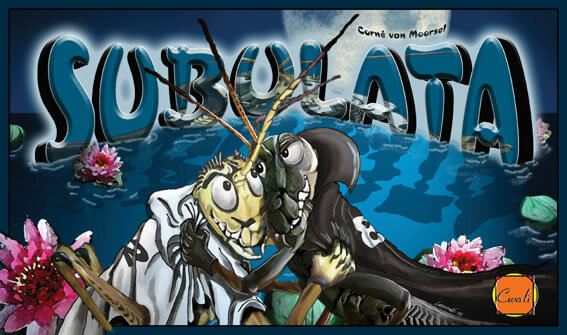 The wite Subulatas prefer the more light water, the dark Subulatas prefer the dark water. The Pond will be randomly build, by arranging the 9 tiles in a square, so that the players sit at opposite corners. Each player places 7 Subulatas on the tile at their corner. The opponent cannot see the value of your Subulata, so keep it a secret. You place your Subulatas by clicking on a piece and then on the place you want to put it. If the Subulata swims in the water, then it always moves 1 space forward. If the Subulata stands on a flower, then it always jumps 2 spaces forward. If the Subulata stands on a leaf, then it always jumps 3 spaces forward. The Subulata can jump over Subulatas. The Subulata may not end a move on a space with one of your other Subulatas. If your Subulata ends on a space with a Subulata of your opponent, then your opponent's Subulata goes out of the game (you may not see its number). In this case your move may go backwards (not diagonal)! This is the only way you can move backward. Capturing a piece of your opponent is always possible, even if your opponents Subulata is in his end tile; Capturing however is not mandatory. In the image below, it's whites turn. The Subulata with number 4 can capture forwards and backwards. However it cannot go to the spot with another white Subultata. If white captures the black Subulata on E6, black can in the next turn capture that Subulata by capturing backwards with his Subulata on E5. it is a player's turn but he has no legal move. At the end the numbers on your Subulatas on the end-tile are points and every captured Subulata is 1 point. The player with the most points win. It's a draw when both player have the same amount of points. In the above image it has become a draw. Despite the fact that white has captured more Subultatas. Black has more points on Subulatas on his end-tile.